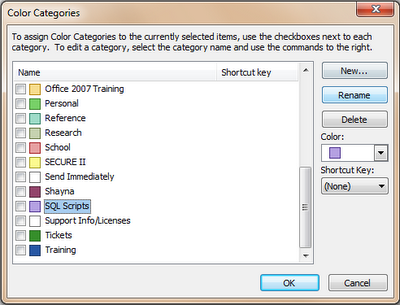 Categories such as '_SQL' & 'SQL Scripts' or '_GP,' 'GP 9,' & 'GP 10' started to appear in my list. In the beginning, separating all these seemed like a good idea, but I soon found that there is a trade-off between how specific my categories are, the time it takes to categorize a message, and how useful my searches are. If I have categories that are too specific, it takes me longer to correctly categorize a single message, and longer to select all the categories I might need for a search. I wanted to simplify things and combine categories. During the process of tuning my category choices, I stumbled upon this feature, which as far as my Google searches reveal, is almost completely undocumented. Now, after a long-winded introduction, here is how to merge Outlook categories for Outlook 2007 and Outlook 2010! Open All Categories from the Categorize menu. Select the category that you wish to be renamed and merged into another category and click Rename. Click Yes at the dialog box. Hopefully these instructions will save some time and help you reduce the number of crazy categories you may have. Leave a comment if this was helpful! GASP!!!!! You saved me SO much time. THanks for thie post.